If the police get their tower, what does that make us? OCEAN BEACH, CA. 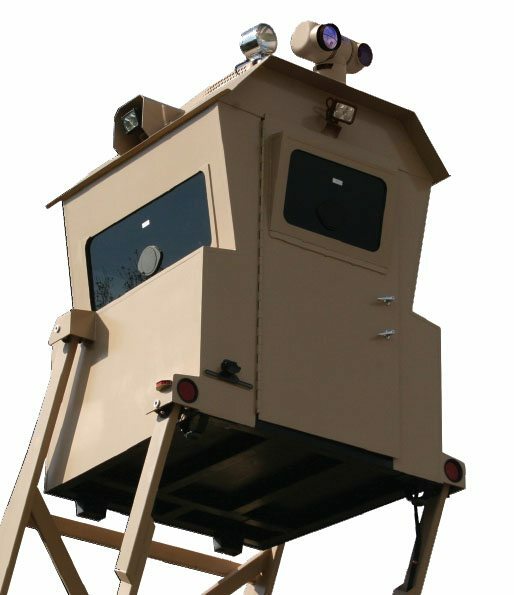 Last week the San Diego Union-Tribune reported that the City’s Police Department has decided to purchase a mobile observation tower. Paying the $119,000 price tag with funds from a Homeland Security grant, the SDPD has already tried the tower out out on numerous occasions, and expects delivery of the two-storied platform in February. ICx Technologies, of Arlington, VA, manufactures the tower. In their brochure, they call the tower “Skywatch Frontier” and describe all their product’s features and advantages. 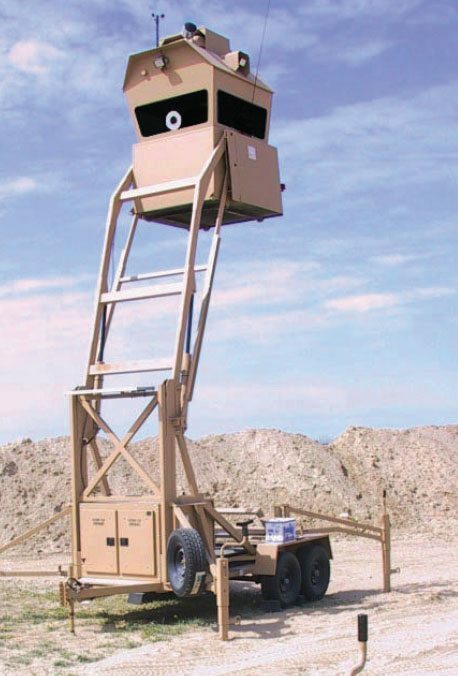 Only trouble is, the tower they offer – the Skywatch Frontier – “was originally designed to meet the needs of forward deployed military forces.” Holy cow! “Critical infrastructure facilities?” Qualcomm, UTC, the beach on Labor Day, shopping malls? The brochure adds that “due to varying levels of enemy activities” the Frontier comes in 3 different types of armor and gun ports. it has an elevation of up to 25 feet and can observe over a second story roofline. What were the manufacturers’ intentions in building it? Clearly, this so-called platform, then, was developed by its manufacturer as a high-tech, mobile guard tower with gun ports. So, if the police get their tower, their Skywatch Frontier, what does that make the rest of us? Sure, close the libraries, and man the towers – the hordes are comin’. Joe – sexist! it’s ‘staff’ the towers. Moll – don’t overlook the forest because of the trees. What’s the answer to the post’s question? i say we send homer simpson out to sabotage the sucka! OB J, Molly and mr fresh – although I do appreciate humor and find it needed within the social justice movements, and I agree with the famous anarchist who said ‘If I can’t dance, I don’t want to be part of your revolution,’ none of you really are addressing a very serious development within our local law enforcement agencies. This tower smacks of police state and right out of a 1970 Ron Cobb cartoon, if you know what I mean – and to keep the humorous aspect goin’. What does that make the rest of us? We’re still freaks, uppity women and politicos…. maybe we should have silk-screened our logo on kevlar vests! If these things start poping up like weeds, I may start a cottage industry importing RPG-7’s.Those towers make such a dandy target. #1 That’s one fancy-damm deer stand, Bubba. $119,000! H3ll there some boys round here make you a fancier one than that, Beer Coolers, Oak-leaf breakup Camo, Self Propelled! Cost ya lot less than that, too. What happens if rioters cut the hydraulic lines? Does it come down in a hurry? Or are they stuck up there ’til someone gets a ladder? #2 Gearing up for martial law? Sooner or later they will run out of bullets, and it sure gets lonley up there when the citizens are waiting you out. #3 They’d rather do ANYTHING than just deal with the legitimate conflicts in societ fairly. I used to live in Mission Beach, a stone’s throw away- I guarantee you those cops will be pervin’ out on girls on the beach, and busting people smoking weed and drinking from bottles (as opposed to cans). “Protect and Serve”? Not likely. #5 Yeah, who gave them the power to do that tower crap? we did..and they will be orderer “SHOOT TO KILL”..I have told you people for a long time now we live under a NAZI/FASCIST DICTATORSHIP POLICE STATE and not many seemed to believe me !! now do you? and Osama Obama wont be any different than Bush..he is under the same crooked system.they have him under control too whether or not you want to see it.he wont be changing anything at all.unless its the look on his face when he wakes up and realizes he has been had and we and him are under police fascist police control.think about it. #6 If the police get their tower, what does that make us? sitting dead ducks living under a controlled nazi/fascist police force !! did you copy that nazi/fascist police state monitors in here? #7 It’s pretty freeky the equipment that is being accumulated to ‘deal with us’. If you had ever spent a bit of time around cops, you would understand that We the People are looked at as the Enemy, period. They only get to deal with the dregs….and wind up with the belief that is all there is. a) 119 grand from a homeland security grant while the rest of the city and state are so broke that we’re (now reportedly) rationing water and sending out IOU’s instead of tax refunds? WTF? b) 119 grand from a homeland security grant while the country is in such a bad recession that the unemployment office looks like a “black friday” shopping spree? c) police state a plenty… add this fun little guard tower to the helicopters that fly over our neighborhoods every night informing (admittedly, every once in a while) the good and humble citizens to be afraid and stay inside because there is a generally-profiled-criminal running about the neighborhood. We have several in our city too (Charlotte NC). I noticed it on the main bl. just outside our neighborhood. I didn’t know much about them, but I do now. And I know how much they paid for them too. I saw one of the in El Cajon, Ca at a Shopping mall. I took vid and pics of it. I could believe what I was witnessing. We are living in a true policed state. A prison without walls. Talking about control and oppression! All it would take now would be cops with machineguns on street corners and tanks patroling our Mexican border.